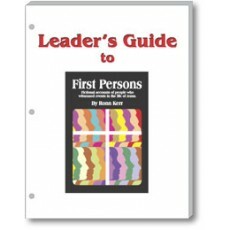 A comprehensive 100-page Leader's Guide to the popular First Persons Student Book (Order No. 324). Loose-leaf, 3-hole punch format allows different chapters to be separated for distribution to different instructors. Each chapter contains substantive background information, many Biblical references, and a variety of teaching suggestions and discussion starters. With this extensive leader's guide, the first person stories in the Student Book become platforms from which students are launched into comprehensive and meaningful Bible study.